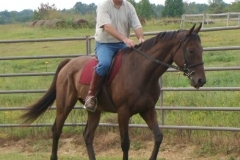 Rap It Up was sold as a Prospect Horse from the track to David Goodman of Athens, AL to be his next fox hunt horse. Rap It Up is learning to open gates. Rap It Up goes trail riding just three weeks off-the-track. 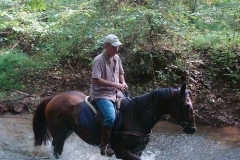 He crosses creeks, meets up with ATVs, learns about fox hounds and takes his first jump. 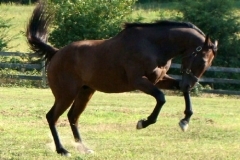 Rap It Up was a Prospect Horse for sale on the Bits & Bytes Farm Web site in August 2009. He was purchased by David Goodman of Athens, AL. 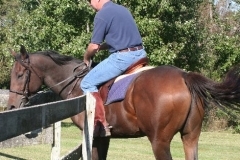 Just a week after arriving in Athens, AL, Rap It Up is being ridden by his new owner David Goodman.